Check out the below article for the details on which information exactly appears on App Store and Google Play. App store settings is the information about your app that appears directly in Apple and Google Play stores once your application is published. What is important to know about the app store settings? The App Store settings section is the only section in the app that you should finalize before submission. Unlike the rest of the content, updating app store settings will require resubmitting the app to the app markets for an additional review that may take up to 10 business days. There is a $199 fee for updating these settings. The full name of your application that appears in the app stores and is the primary way attendees find your app when searching by keyword. The Icon Label is the short text label that appears under the application's icon on your phone or tablet. To learn more about creating an app name and icon label check out our dedicated article. The icon appears on the home screen of a mobile phone and allows users to visually identify your application. Follow this link to get more useful info on creating an icon for your app. 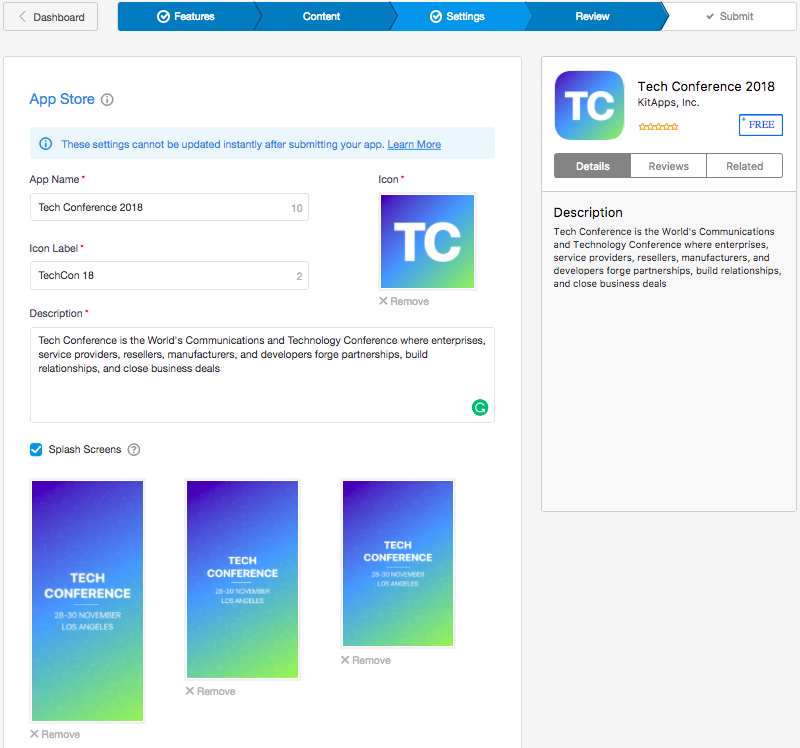 The description helps you create the desired impression and get attendees to install the app. It gives people a general overview of the app, explains its major purpose, and functionalities. Find out how to write a good description in the article here. A splash screen is an image that is shown while your application is loading. A splash screen is a great way to give your app a look that’s unique. Learn more about splash screen requirements and specifics here.